Sharkoon has introduced a DIY kit that lets users build their own external storage devices with the USB 3.1 Type-C interface. The kit is not expensive and resembles similar devices from other makers: it contains an enclosure for a drive as well as a USB 3.1 Type-C cable. The key element here is Type-C, although as with many devices of a similar nature, the 10 Gbps is limited by the chipset to 8 Gbps, and then further by the SATA protocol. 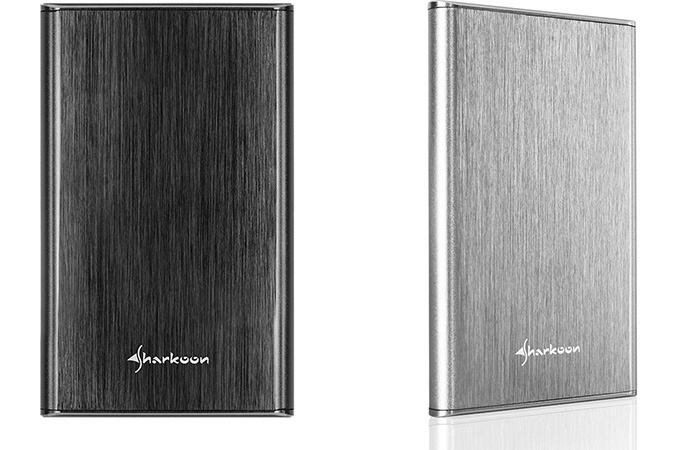 The Sharkoon Rapid-Case 2.5” USB 3.1 Type-C is a sleek enclosure (132×80×14 mm) made of black or silver brushed aluminum that can house a 2.5”/9.5 mm storage device and has a USB 3.1 Type-C header. The chassis weighs 83 grams and when populated with an HDD, its weight will increase to something like 170 ~ 230 grams depending on the drive used. The only thing that owners need to do to use the device is to install an appropriate pre-formatted HDD or SSD inside. Update 2/14: The paragraph was re-written after Sharkoon published full specs of the enclosure. The chassis contains ASMedia’s ASM1351 USB 3.1-to-SATA bridge, which only downs physical bandwidth to 6 Gbps, but it further reduces it by the overhead introduced by SATA’s 8b/10b encoding. In the end, even if the Sharkoon Rapid-Case is populated by a high-end SSD, performance of the latter will be limited by SATA, not USB 3.1 Gen 2. In fact, this is the case with a lot of USB 3.1 Type-C storage devices: while they formally support 10 Gbps data rate, they use SATA drives inside with a maximum throughput of 6 Gbps (which is still higher than what you get from USB 3.0-supporting devices at 5 Gbps). On the other hand, it is impossible to get a "true" 10 Gbps data rate with contemporary PCs that use ASMedia's ASM1142 USB 3.1 Gen 2 controller. The ASM1142 is a PCIe 3.0 x1 chip supporting a maximum bandwidth of up to 8 Gbps, which is below 10 Gbps specified by the USB 3.1 Gen 2 standard. Therefore, in cases of systems powered by the ASM1142, USB 3.1 Gen 2 devices are limited by 8 Gbps throughput. Despite the fact that right now not a lot of external storage devices (factory-made or DIY) can take advantage of USB 3.1 Gen 2’s 10 Gbps data rate, it is important that such devices make it to the market in general. Nowadays many new PCs feature USB Type-C ports and it is important to build up an ecosystem of devices with this interface. Furthermore, if you need a lot of storage space, you are going to use a 2.5" HDD that has a maximum media to host transfer rate of less than ~200 MB/s and thus not requiring even 5 Gbps of USB 3.0. 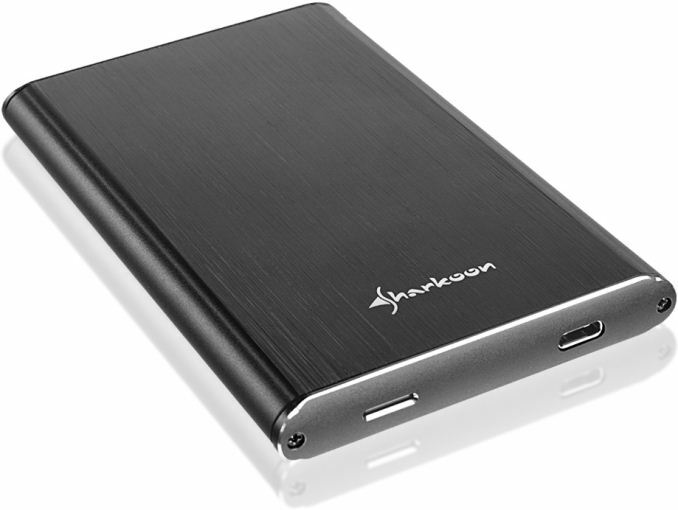 The Sharkoon Rapid-Case 2.5" USB 3.1 Type-C is available from select retailers in Europe for the suggested retail price of €24.99. Well, there are a few things, one is the physical connection format which will become more and more commonplace, the second is the higher power delivery specs of the the type-c interface. There are some drives out there (HDD's not SSDs) which exceed the 7.5w max of USB 2.0. The big question is, is there TRIM support?